This time of year, much of New York’s landscape is dappled with bare-branched deciduous trees and dark, evergreen conifers. These cone-bearing conifer trees are adapted to survive harsh, cold weather, from the microscopic structure of the leaf to the overall shape of the entire tree. Despite the needle-like shape, conifer leaves serve much the same function as the flat, broad leaves of a sugar maple or oak tree. Most conifers keep their needles year-round. 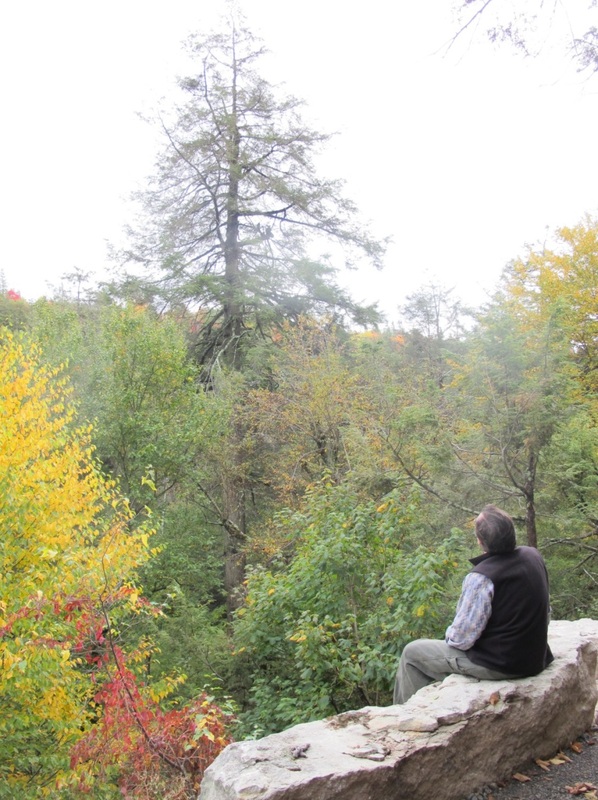 Do you know which New York native conifer drops its needles every fall? It is the tamarack (Larix laricina), a member of the larches, shown below. On the left, these tamaracks are changing color. Every autumn the needles turn bright yellow and will fall off the tree by winter, so they are not considered an “evergreen.” On the right, a closer view of tamarack needles, which grow from a woody spur in clusters of ten to twenty. The needles are approximately ¾” to 1 ¼” inches long. When talking about evergreens, pines may first come to mind, but conifers also include firs, spruces, hemlocks, and others. But how do we tell which is which? Here are a few quick tips to help narrow down the tree group simply by looking at the needles. First, let’s look at pines. Pine trees have needles in bundles on the stem. The number per bundle depends on the species, but if you find bundles of five needles or less, you’ve likely discovered a pine. There are six native species of pine in New York, but two you may be most likely to encounter are white pine (Pinus strobus) and red pine (Pinus resinosa). The eastern white pine (left) and its bundled needles (middle and right). This species of pine has five needles per bundle (and as a memory trick, there are five letters in the word “white”). The needles are soft and flexible, measuring about 2 to 4 inches long. Spruce trees have needles that are individually attached to the branch with small woody pegs. A key characteristic for spruce needles is that they are square and can roll easily between your fingers. They are usually sharply pointed. Also, if any needles are shed the woody pegs make the branch feel rough, unlike the smooth branches of firs. There are three native spruces in New York: the white spruce (Picea glauca), the black spruce (Picea mariana), and the red spruce (Picea rubens). The white spruce (left) and its needles (right), notice the woody pegs that attach the needle to the branch. Needles are stiff and measure about ½” to ¾” inches long. This species is sometimes called skunk spruce or cat spruce due to the strong odor from broken needles. Fir needles are also individually attached, but unlike spruces, they are attached by what resembles a suction cup (look for a circular base). They are typically soft and flat with rounded needle tips. There are two whitish lines on the bottom of the needle. Another distinguishing characteristic of firs is that their cones stand upright on the branches, rather than droop down. The only native fir that can be found in New York is the balsam fir (Abies balsamea). A stand of balsam fir (left) and its needles (right). Balsam fir needles are dark green and measure around ¾” to 1 ½” in length. The tips of the needles can be blunt, rounded, or notched. 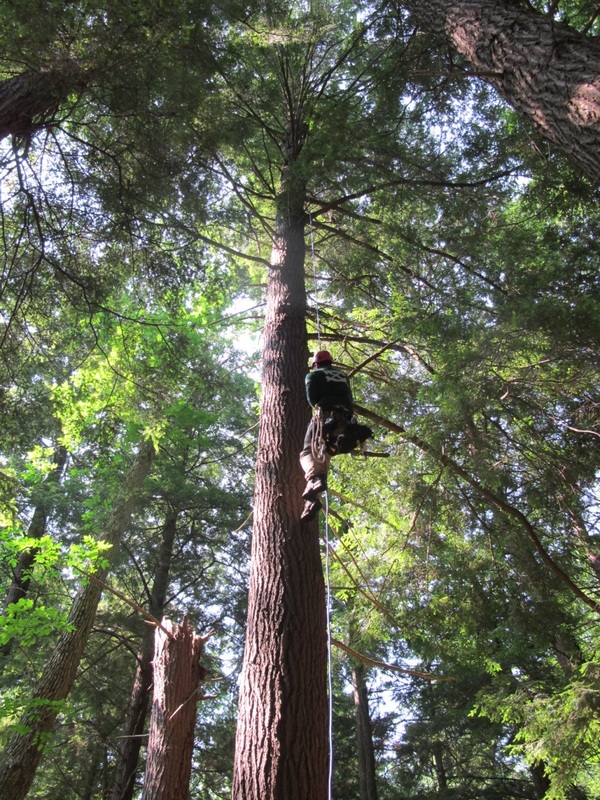 Hemlocks have individually attached needles that are flat. 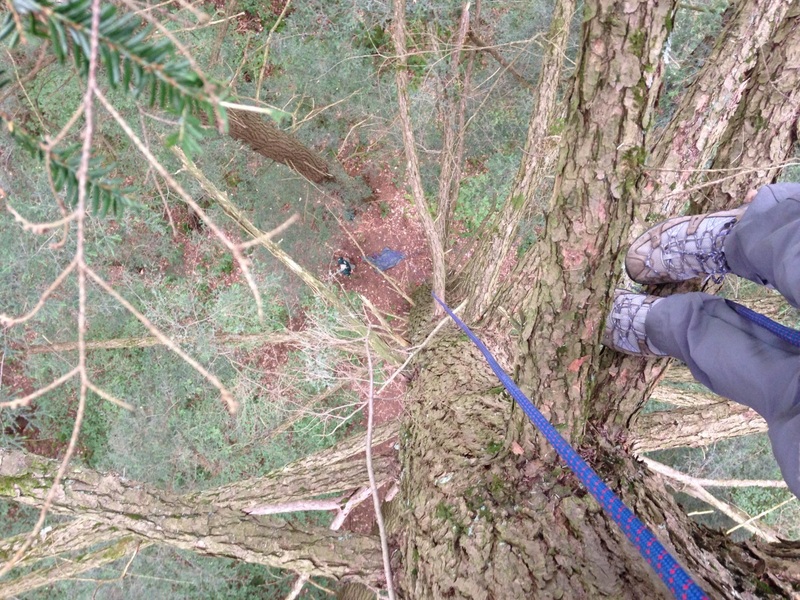 Unlike firs, each hemlock needle has a small stem attached to a woody peg. 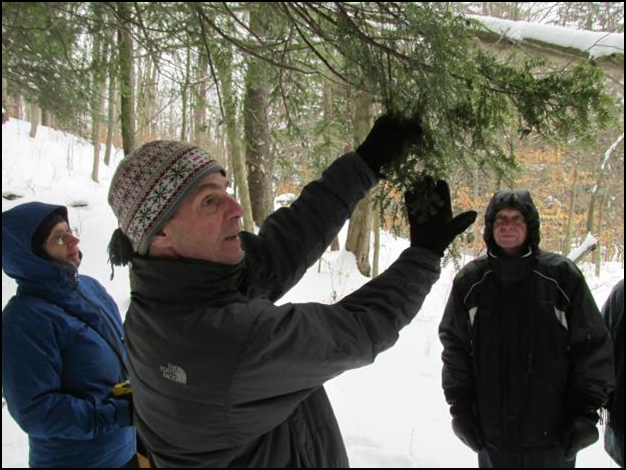 In New York there is only one native hemlock species, the eastern hemlock (Tsuga canadensis). 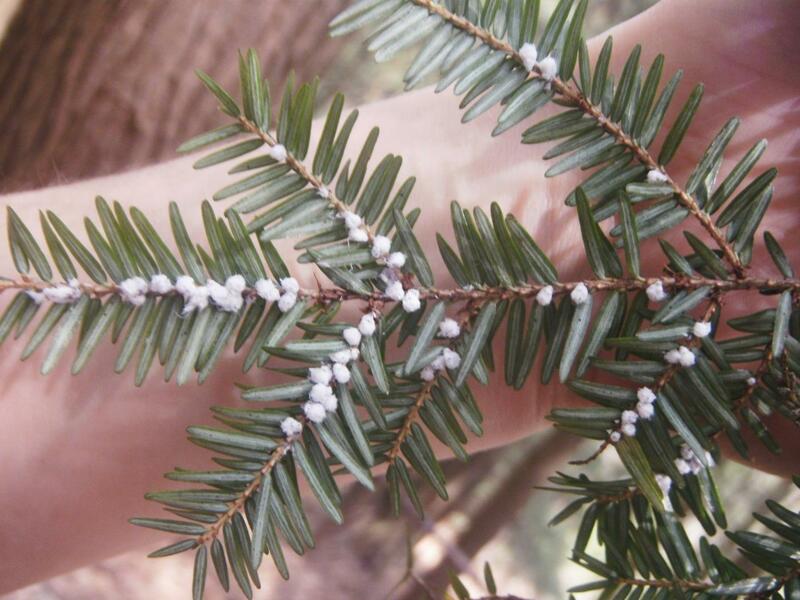 While you’re out testing your needle identification skills, keep an eye out for the invasive pest hemlock woolly adelgid, which creates white woolly masses at the base of hemlock needles. 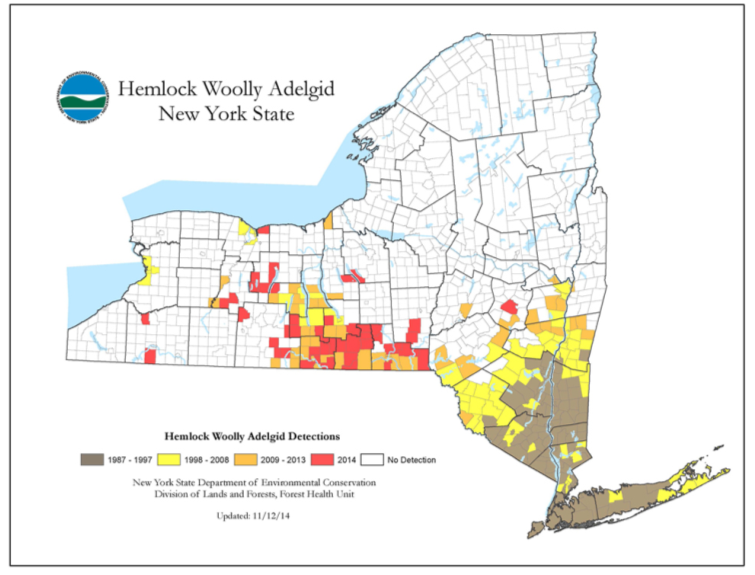 This insect causes tree health to decline and can lead to the death of the hemlock in as little as four years. A young eastern hemlock stand (left) and its needles with stems (right). Needles are usually a shiny green. On the underside of each needle, you can see two characteristic white lines (shown in the picture). The needles are typically one inch or less in length. Are the needles in bundles or individually attached? Does the needle roll easily between your fingers or is it flat? Are the needles attached to a stem, woody peg, or a “suction cup” structure? Just by taking a quick look (and maybe pluck) at the needles, it is often possible to categorize the conifer into pine, spruce, fir, or hemlock. If you come across a conifer that doesn’t fit into these categories, try looking at cedars or junipers too. And the best part of studying conifers is that you can look at needles all year long! Unless it’s a tamarack, of course. If you’d like to learn more about some key conifers, check out this blog post to learn about identifying specific species you may encounter in State Parks!